ARLINGTON, Texas — When DeAndre Daniels ended his meandering recruitment in June 2011 by announcing that he would be attending UConn, the five-star forward's decision inspired an unusual response. "A lot of people were kind of mad and gave me a hard time about it," Daniels said Sunday. "They said, 'How could you go somewhere you didn't visit after you dragged out your whole recruitment?'" Daniels' decision indeed was puzzling because he hadn't ever mentioned UConn as a contender in the months leading up to his long-awaited decision. Not only had the Huskies not shown much interest until that spring, Daniels never visited the UConn campus prior to his commitment because he previously had used the five official visits the NCAA allows recruits to take. It wasn't like Daniels didn't have plenty of other enticing options either. Texas was Daniels' childhood favorite team and continued to pursue him even after he backed out of an initial commitment the previous year. Kentucky became the favorite after Daniels reopened his recruitment, but that cooled when he decided he wasn't comfortable enrolling after the first semester halfway through the 2010-11 season. And Kansas emerged as a strong contender after that because the Jayhawks had diligently recruited Daniels for months and added one of his closest friends as a walk-on. "I thought he was going to Kansas," said Dinos Trigonis, Daniels' former AAU coach with California-based Belmont Shore. "His close friend was going there. His parents were going to move to Kansas. There would have been a comfort factor there." Added Daniels' prep school coach at IMG Academy, Andy Borman, "When he committed to UConn, absolutely, it caught a lot of people by surprise." That Daniels chose UConn has turned out to be a tremendous coup for the Huskies. He remained loyal to the program despite a coaching change and a one-year-postseason ban and has since emerged as one of the catalysts for UConn's surprise run from a No. 7 seed to Monday night's national title game against Kentucky. In five NCAA tournament games, Daniels is averaging 17.6 points and 7.4 rebounds, a significant increase over his inconsistent production in American Athletic Conference play. The 6-foot-9 junior scorched Florida's vaunted defense for 20 points and 10 rebounds on Saturday night as the Huskies advanced within a victory of their fourth national title. It's a testament to the approach taken by former UConn coach Jim Calhoun and then-assistant Kevin Ollie that Daniels will be in a Huskies uniform Monday night. Upon recognizing that they still had a legitimate chance to sign Daniels despite entering his recruitment so late, they pursued him by being honest and forthright with him. They made no promises of a starting role or immediate playing time, instead telling him only that he'd receive what he earned. It also probably helped that Ollie grew up in Los Angeles like Daniels did, giving him some added comfort level even while playing on the other side of the country. UConn's long history of producing NBA players also factored in Daniels' decision to pass on the schools that had recruited him longest and go with one he'd never even seen in person. "It was a gut feeling," Daniels said. "I was comfortable with them. I knew this place was a family and I knew they'd be honest with me. They never promised anything to me. They always kept it real with me from day one." Calhoun acknowledged Sunday he too didn't expect Daniels to choose UConn, but he understands the decision more now that he knows the junior forward better. Daniels is not like most prep All-Americans, from his quiet, understated demeanor, to his desire to be challenged rather than coddled, to his decision to spend a year in prep school to better prepare himself to make an impact at the college level even though he had sufficient grades to play in college right away after high school. "Then I was surprised," Calhoun said. "Not so much now when I get to know his personality. He just needed to be told we're going to love you, we're going to coach you, it's going to be hard and it's going to be good. Trust me, it was not complex. He's a bright, quiet, sensitive kid." 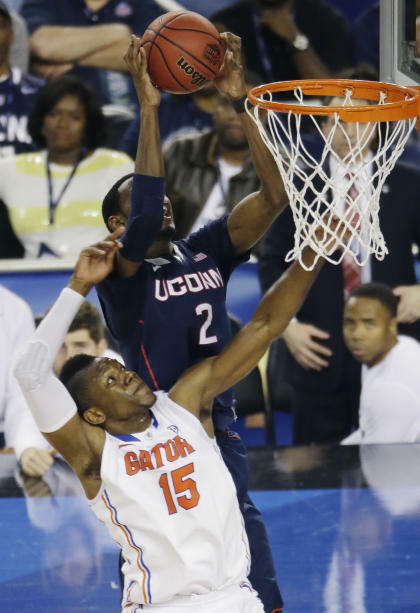 Whether Daniels had the talent to be an impact player for UConn was never an issue. From the moment he set foot on campus, he had the size of a power forward and the quickness, outside shooting and ball handling of a wing. The question was whether Daniels would ever be able to harness those skills sufficiently to become a reliable threat. He played sparingly as a freshman behind Andre Drummond, Roscoe Smith and Alex Oriakhi, then lacked consistency as a sophomore and for much of this season as well. Sometimes his low-key demeanor contributed to him being content to defer to standout guards Shabazz Napier and Ryan Boatright too often. Other times he'd miss a few early shots and let it affect his effort level defending and rebounding. During a late-season slump in which he scored eight or fewer points in five of six games, Daniels' father set up a late-night conference call between him, his son and Trigonis. They sugarcoated nothing with Daniels, reminding him that consistency was a must for him to attract interest from the NBA and urging him to make the most of the opportunities he did get rather than getting frustrated over a lack of touches. The result has been Daniels both emerging from his slump, becoming a more vocal leader for the team and showing more personality on and off the floor. When Calhoun told him earlier this week that nobody was mentioning his name, Daniels gave an unusually bold response, telling his former coach "they will be Saturday." Daniels also saluted the baseline TV cameras after a big transition dunk against the Gators on Saturday night, an out-of-character move for such a quiet, polite kid. "He's showing a lot of emotion now," UConn senior Tyler Olander said. "Before he was going through the motions, whether it was good or bad. You'd never know if he was excited, happy, mad. He almost had a Jeremy Lamb expression, that same plain face. Now he's out there yelling and screaming. When you put that into the game with his skill set, ability and potential, it's special to watch." Daniels has endured a tortuous recruitment, a disappointing freshman season, a coaching change, a postseason ban and bouts of inconsistency, but now the junior is finally where he hoped to be. He's one win away from a national championship and one more big game away from solidifying himself as a potential draft pick this June. All that success is validation for Daniels' improbable decision to come to UConn without ever visiting the campus first. He could have been at Kansas, he could have been at Texas or he could have been on the other bench Monday night playing for Kentucky, but he's happy where he is. Said Daniels, "It was a great decision for me, and I wouldn't change it."